I painted this little painting over the weekend using the same process I detailed in my last post. You might find it easier to see what I meant by the spots of color coming together to create the vehicles. They are not drawn beforehand. It works better for me if I lay down the dark colors and then the light ones where I see them forming the correct image. They are really quite loose and it is the placement of the bright splashes of light reflecting on them that gives the sense of realism. In the road a good deal of my under painting shows through and that helps keep the expanse of road in front of the approaching car from being too flat and poster like. That is fine if that is the style you are going for but that is not what I am after in my own work. I think I am gaining enough confidence to attempt some much larger paintings than I have been doing. I may discover that the smaller format works best for me but I want to find out. More to come! This is the final version after I repaired the scratches suffered when the painting fell from the easel. Twice! It is also a more accurate photo so far as the color is concerned. By the way, I now wad up some tape and attach it to the back of the panel, pressing it against the easel as clumsy artist protection. I have been asked by several people to describe my process for painting such a detailed cityscape. There is the word I want to talk about. The painting is detailed but then it isn't really. I will come back to that and explain. Other questions; Do I do a detailed drawing on the panel first, do I use photos, is this plein air? No, yes and sort of. I do an on site drawing in a small 4x6 inch sketchbook which gives me a lot of freedom to walk around looking for images for paintings. Before I head out I scale rectangles on the sketchbook pages using an architects rule to accurately reduce the size and shape corresponding to the panels or canvas I plan to paint on. Then when something inspires me I draw the image in the rectangle corresponding to the shape I think it would look best in. My favorite drawing tool for these sketches is a ballpoint pen because they are fluid and great for continuous line drawings. I generally carry both a fine and a medium point pen. I take digital photos for references that my quick sketch can't provide. Also in the field the camera is handy in the following way....For the painting above I used a photo taken from further back down the avenue near the National Gallery. 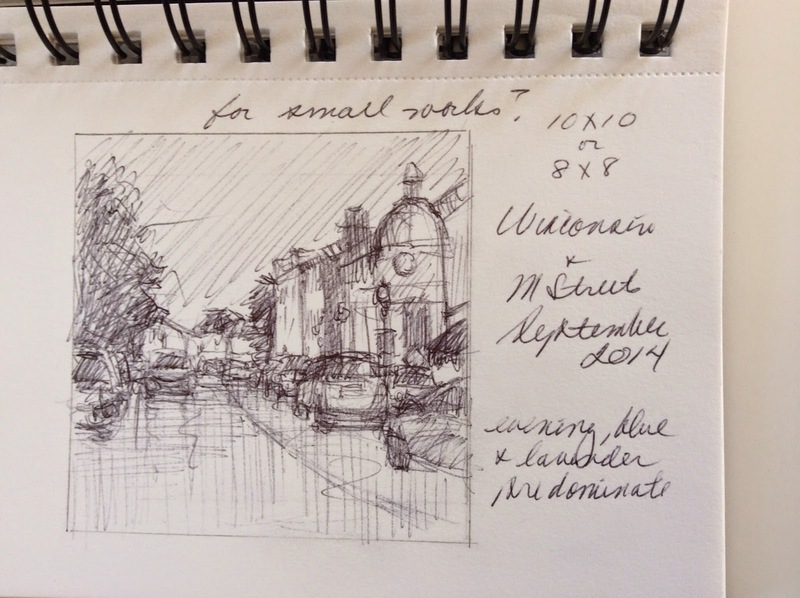 On site I zoomed in on the photo to find the best composition and then moved up the street closer to my chosen image, stood in the broad crossing median Pennsylvania Avenue provides and scrawled out my sketch very quickly. Besides this process I sometime do small plein air paintings and then use them as studies for the larger paintings. That is for days I plan to stay in one spot. Back in the studio I often do a color study in another, larger sketchbook using oil on paper. I did not do that for this painting. So back to DETAIL. How much detail? I ask myself that at the start. For me, if I am doing a well known place such as Pennsylvania Avenue , I feel there should be enough detail so the important buildings are recognizable but not so much that they become architectural renderings. I do not use straight edges. I will rest a yard stick on the top of the painting to support my arm (like a mal stick) and paint my edges freehand. I prefer the edges to be soft rather than hard. I eliminate details that are not important. Windows should follow the perspective but you will notice they are not detailed. The busy traffic beyond the foreground vehicles are really splashes of paint dominated by bright headlights. Enlarge the image and you will see what I mean. This painting is about a moment on Pennsylvania Avenue and it is really the atmosphere, the light in the sky, the sparkling traffic lights and the reflections on the wet pavement all combining to create a special moment that can be related to emotionally. I should mention it was not raining that day but I knew that is how I wanted to paint it. 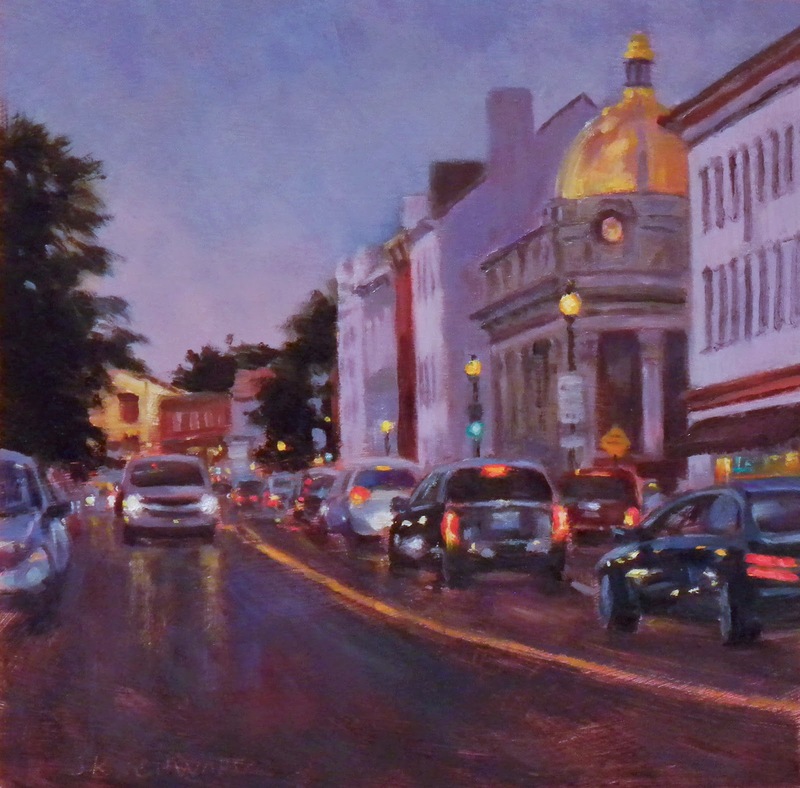 I studied traffic on rainy days here in McLean to know how to paint lights reflecting on wet pavement in the evening. Lastly, I did not take progress photos of this painting but if you go to the menu on the right and go back to 2011 ( September and October) you can see the progress on another cityscape "5th and Waverly". The painting above was created the same way starting with the same color toned panel and major forms blocked in with a mid value, neutral color. I hope this helps! If Blogger doesn't mess me up I will now upload a photo of that little 4x6 sketch made on site. 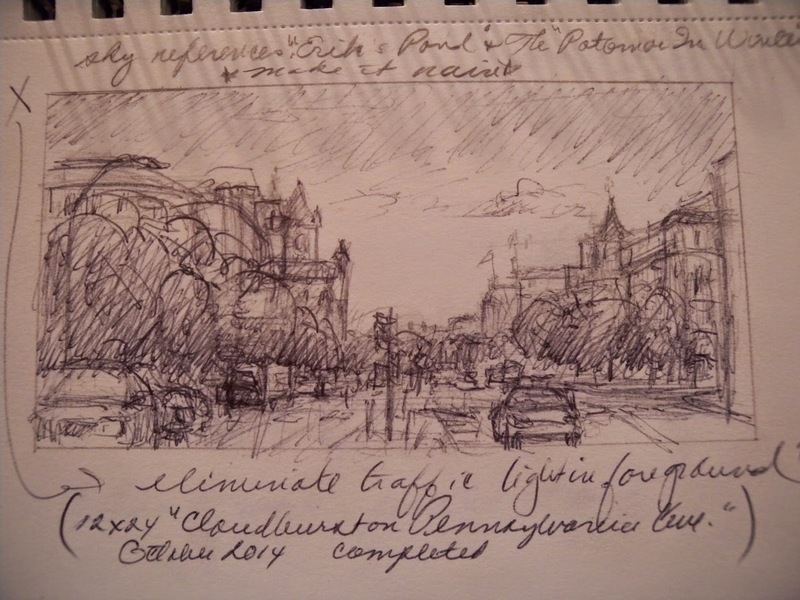 I am still hooked on cityscapes and particularly enamored with Pennsylvania Avenue. Don't get me wrong, there are plenty of other great subjects in DC but I just love the buildings along this thoroughfare and also the gorgeous sunsets when facing in this direction or the beautiful morning light when facing the Capitol. This one is not quite complete. I have some little things to touch up and add (such as a forgotten lamppost) but mostly I have some repairing to do. Yup, I did it again. This one took not one but two tumbles from the easel and I was so thankful that I painted on a panel and not canvas. Mercifully I had just moved my palette to my other studio easel or this one would have been a mess. I'm a klutz, what can I say. The damage is some scratching which might be problematic in the dark areas but I am not too worried. As I was painting this one I found myself thinking of my days as an abstract artist and my transition to representational art. I was thinking about composition and my feelings about details as in " the devil is in them". I would like to post about this when I get back in town as I am beginning to understand something about my paintings. Thanks for reading and I will be back soon!